(Nanowerk News) Scientists have developed a photoelectrode that can harvest 85 percent of visible light in a 30 nanometers-thin semiconductor layer between gold layers, converting light energy 11 times more efficiently than previous methods. 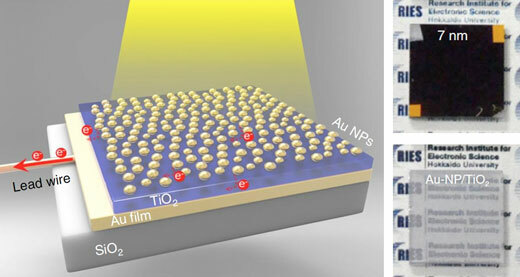 In the study published in Nature Nanotechnology ("Enhanced water splitting under modal strong coupling conditions"), the research team sandwiched a semiconductor, a 30-nanometer titanium dioxide thin-film, between a 100-nanometer gold film and gold nanoparticles to enhance light absorption. When the system is irradiated by light from the gold nanoparticle side, the gold film worked as a mirror, trapping the light in a cavity between two gold layers and helping the nanoparticles absorb more light. To their surprise, more than 85 percent of all visible light was harvested by the photoelectrode, which was far more efficient than previous methods. Gold nanoparticles are known to exhibit a phenomenon called localized plasmon resonance which absorbs a certain wavelength of light. “Our photoelectrode successfully created a new condition in which plasmon and visible light trapped in the titanium oxide layer strongly interact, allowing light with a broad range of wavelengths to be absorbed by gold nanoparticles,” says Hiroaki Misawa.